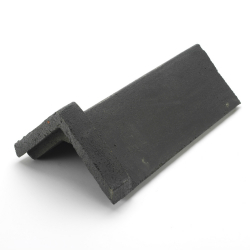 Good ridge tiles, competently installed are an essential part of a building’s structure. As well as keeping rain and moisture out of the roof space, they can also add an aesthetic quality to the roof architecture. Ridge tiles can be selected in colours that either complement, contrast or match the roof covering. While the two basic formats are either angled or half-round, a little extra investment opens up a vast range of ridge tile shapes and styles. Attractive and imaginative options are available to suit both traditional and modern architecture. We stock ridge tiles to suit every budget. Manufacturing materials include clay, concrete, fibre cement and plastic. While each material has its own merits, the options available depend on the method of fixing. Currently, two fixing options are approved in the UK: combined mortar and mechanical fixing with sealed ridge screws, or branded dry-fix systems. Combined mortar and mechanical fixing, rather than mortar alone, is now specified in UK building regulations. Dry-fix systems are also gaining in popularity. This mortar-free solution makes fixing quick and simple – whatever the weather.